If you love Great Danes or know somebody who does, our 3D Jumbo Great Dane Dog Chocolate Mold is perfect for you! Celebrate your four-legged friend’s birthday by making a GreatDane-inspired chocolate candy or fill it with cement for a fun yard decoration. These molds are 10-1/2” x 6-1/4”, strong and weigh 55.34 ounces. For the 3D effect, order the other half of this mold, too. 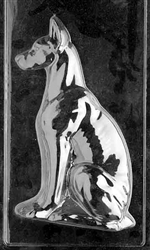 Great Dane Mold let's you show your pride in your pooch. Each piece is 10-1/2" x 6-1/4"